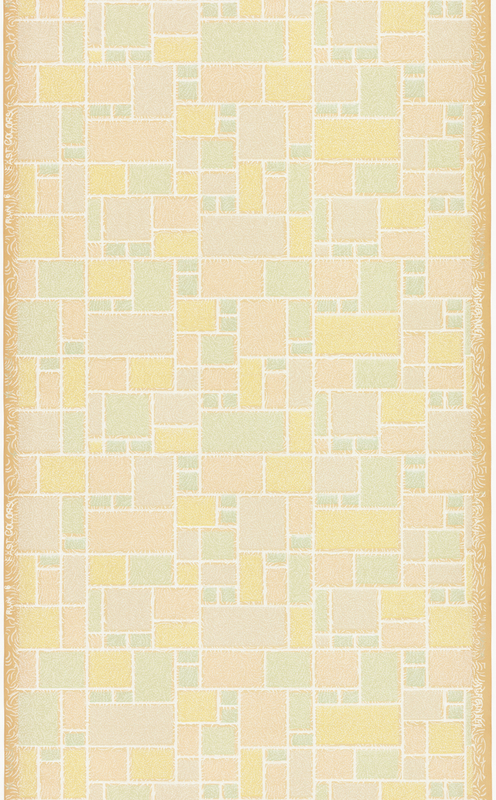 I thought this was a charming pattern, with its pastel-colored geometric background pattern reminiscent of tilework. The scrolling white lines covering the surface give the design a textural look, softening the appearance of all the hard lines. They also remind me of the Sno Ball pastries with the coconut-covered exterior. This was a very inexpensive wallpaper given the fact that it is ungrounded, which is even printed in the selvedge. Being ungrounded saved one step in the manufacturing process and made the paper cheaper to produce. Applying a ground color required first running the roll of paper through a printing machine which applied a thick opaque layer of pigment to the paper, effectively hiding the appearance of the paper as it oxidized and turned brown, which is evident in the two selvedges. This was a separate machine from the one that printed the design. This is understandable for a Depression-era wallpaper as it allowed people to beautify their homes for a moderate cost. There isn’t much information known about this paper, but the words “Fast Colors” are printed in the left selvedge so we do know it was produced in 1928 or later, the year wallpaper became fade proof or color fast. This type of design was usually recommended for kitchens, breakfast rooms or pantries, which explains the tile format. Just don’t hang them too close to the sink or food prep areas as they were not yet waterproof or washable.